Stripes, spots, elephants and peacocks. Take a walk down the aisle of any store right now and you’ll see one of the hottest trends in décor — animal and bird prints — migrating onto various items, from patio cushions and vases to lamps and planters. 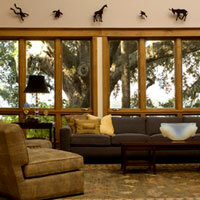 We love animals and their prints because they’re so versatile. 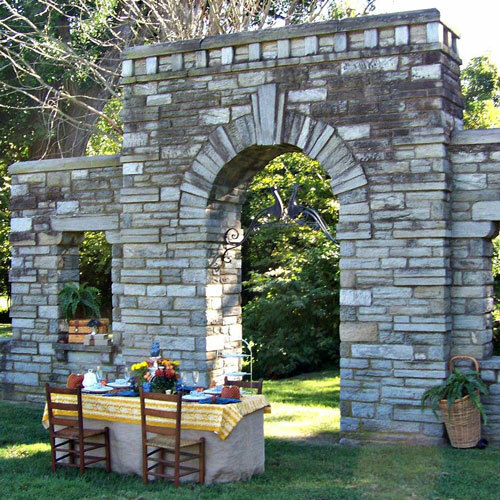 You can go all out and redecorate your entire outdoor space with them or just sprinkle in a few choice items here and there. Plus, animal prints mesh perfectly with emerald green, the 2013 color of the year. In light of everything out there, we thought it would be fun to explore a bit of bird and animal symbolism in different cultures. Who knows? Perhaps you are “drawn” to one animal over another through your subconscious. 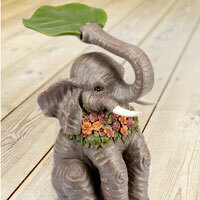 Let’s start with the elephant, one of the most popular figures out there right now. The elephant symbolizes strength and power, both mental and physical. In India, the elephant god Ganesha is widely revered as the Remover of Obstacles, and more generally as the Lord of Beginnings, patron of arts and sciences, and the god of intellect and wisdom. In most Asian cultures, a trunk pointed upward signals good luck, so look for that when you make your purchase. 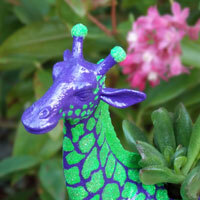 Giraffes are having their day in the sun now too. Having such long necks (up to 7’) allow giraffes to see far, so it’s not surprise that they symbolize farsightedness, and the ability to meet future goals with determination. According to shamanicjourney.com., giraffes “serve as a link between the higher and lower worlds. Their flexible necks let them see what is behind, next to and in front of them. Do you like traveling? If so, the camel may appeal to you. Because of its purpose, to get people and goods across inhospitable deserts, the camel signifies actual or spiritual journeys that you may want to take (or literally be taking) soon. 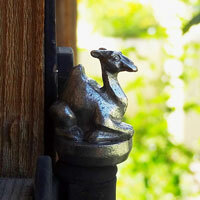 As animal symbolic in outdoor décor goes, these door hinges are subtle. Handmade in Los Angeles, they’re not much larger than the top of most door hinges. It’s not surprise that tigers, the largest cats in the world, symbolize strength, beauty, and power. Additionally, for those who believe in animal totems, the tiger symbolizes primal instincts, unpredictability, and ability to trust your yourself. 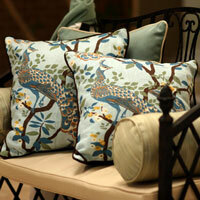 This patio furniture scene has a fine example of animal print cushions. Animal symbolism aside, animal print pillows or patio cushions can act as neutrals, letting you use bright colors along with them. 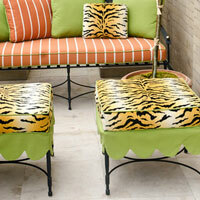 This tiger print patio furniture set was photographed by Alex Amend on a rooftop terrace in San Francisco. I have always loved watching hummingbirds stop to sip nectar from a bird feeder. However, I had no idea that in the Andes of South America, the hummingbird is a symbol of resurrection because it seems to die on cold nights, but comes back to life again in the morning. And as if resurrection weren’t enough, the animal symbolism of these multi-colored birds goes even further. 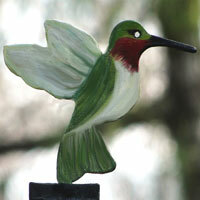 The hummingbird also represents love, joy, and beauty. 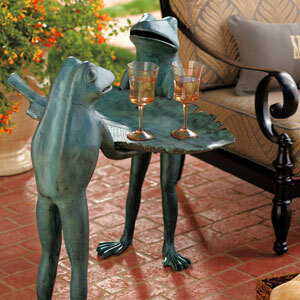 No wonder they’re so popular with so many outdoor living enthusiasts! 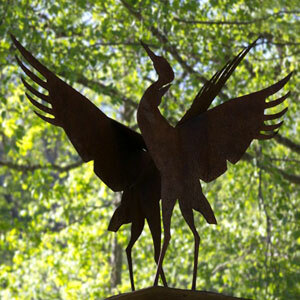 Last but not least, we’ll talk about the animal symbolism of the peacock, a bird revered in cultures across the world. 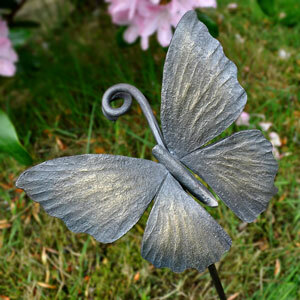 Signifying integrity, nobility, and holiness, the peacock will definitely add a touch of grace to your outdoor décor! 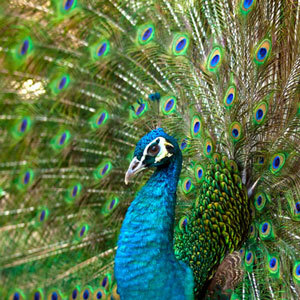 Ancient Romans believed the bird symbolized the stars while in many Asian cultures the peacock represents benevolence, patience and kindness. In the west, the peacock represents the holiness and sanctity of the church. Of course there are many other animals that are not listed here—zebras, cheetahs, owls, and moose just to name a few. If you’ve got a favorite animal print or piece of animal decor, upload it to our Facebook page and tell us why you love it!